Once there was an elephant. 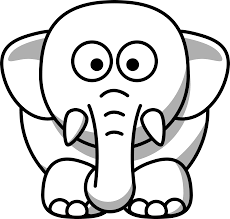 A very lonely elephant. He lived in a small house in the middle of the woods. He was very sad. He did not have any friends. His closest neighbor was 5 miles away! The elephant always knew that he needed a friend but was very afraid. He thought no one would say yes if he asked. So he stayed inside his house in the woods. One day the elephant was cooking in his kitchen. He left the stove for one minute. He was not supposed to do that! But, elephants are not good cooks. Suddenly, a spark came out of the pan. The spark got bigger and bigger until the spark was no longer a spark. It was a FIRE. The elephant did not know what to do. I mean, what was he supposed to do, put out the fire with his paw? Even though he was afraid of seeing people, he had no choice but to go to town to get help. Off he went to the fire station. As the firefighters were rushing off to his house, he saw a dog. Not just any old dog but a Dalmatian. The elephant saw the dog getting its gear to go off and help the firefighters. Just then, an idea popped into the elephant’s head. “I will get a pet!” he thought. The elephant went a few doors down to the animal shelter. He looked at short dogs and tall dogs. Fat cats and thin cats. Yellow fish and red fish. There were no dogs with spots like the Dalmatian at the firehouse. The elephant did not know what to do. But then he saw the birds. Blue birds and red birds and…then he saw it… it was a bird with blue and red stripes, very small eyes and two different color wings—one red and one blue. It had a little black dot on its blue head. The elephant thought it was so so cool! Amazing, really! And it was only $.99. By the time the elephant walked back to his house in the woods, the fire was put out. He and his new friend, Bird, went inside, excited to start their new life. The elephant was not lonely anymore. This entry was posted on March 6, 2015 by Hilde Kate Lysiak and tagged elephant makes a friend, hilde lysiak, Orange Street News, selinsgrove, short story.